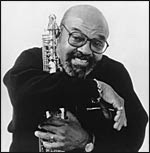 We saw jazz legend James Moody perform live on Saturday as part of the Bermuda Festival and he was pretty awesome actually. My knowledge of jazz is limited to say the least but to watch 83-year old Moody rouse and inspire a packed audience was something else. Moody and his quartet consisting of legendary trumpeter Randy Brecker, pianist David Hazeltine, bassist Todd Coolman and drummer Dennis Mackrel were fantastic to watch close up. One of those nights when one goes to a concert with no pre-conceived ideas, but comes home and goes straight onto iTunes.